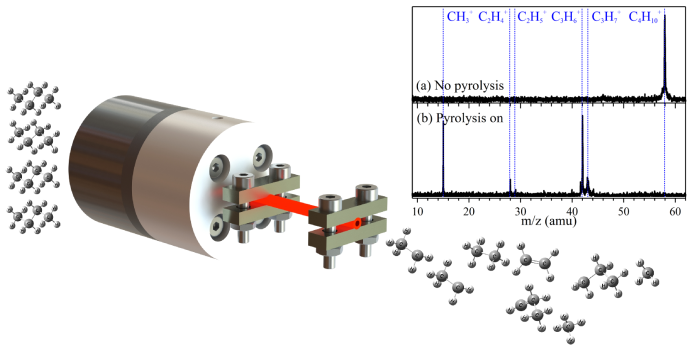 A study team led by Prof. ZHANG Weijun at Anhui Institute of Optics and Fine Mechanics (AIOFM), Hefei Institutes of Physical Science, has made new progress in the dissociation dynamics of state-selected CH3F+ ions. Their work, entitled Double Imaging Photoelectron Photoion Coincidence Sheds New Light on the Dissociation of State-Selected CH3F+ Ions has already been published online in The Journal of Physical Chemistry A.
Dissociation of state-selected ions is an important content and plays an essential role in chemical reaction dynamics. Dr. TANG Xiaofeng, one staff of the group, has been focusing on the technical development of photoelectron photoion coincidence spectroscopy (PEPICO), a powerful method to prepare and analyze state-selected ions, and its applications for several years. Just very recently, TANG, in cooperation with Synchrotron SOLEIL, the French third generation synchrotron facility, has investigated vacuum ultraviolet (VUV) photoionization and dissociative photoionization of methyl fluoride (CH3F) in detail by using synchrotron radiation coupled to a double imaging photoelectron photoion coincidence (i2PEPICO) spectrometer. The production of several fragment ions including CH2F+, CHF+, CF+, CH3+ and CH2+ as a function of state and internal energy of CH3F+ ions was identified and analyzed, with their individual appearance energies measured through threshold photoelectron spectroscopy (TPES). Dynamical information was inferred from electron and ion kinetic energy correlation diagrams measured at chosen fixed photon energies. Then the detailed mechanisms governing the dissociation of state-selected CH3F+ ions prepared in the X2E, A2A1 and B2E low-lying electronic states as well as outside the Franck-Condon region have been revealed based on the present experimental results and existing theoretical calculations. Especially up to three different fragmentation channels to produce the CH2F+ and CH3+ fragment ions were firstly identified and assigned from different electronic states of CH3F+. In addition, in this study the spin-orbit splitting states of the F fragments, 2P3/2 and 2P1/2, in the CH3+ + F dissociation channels were clearly determined and adiabatically correlate to the X2E ground state and the A2A1 electronic state, respectively. According to the reviewers of The Journal of Physical Chemistry A, the work received high comments as "one of the most successful studies of its kind". The work was financially supported by the National Key Research and Development Program of China, the National Natural Science Foundation of China and the Natural Science Foundation of Anhui Province.